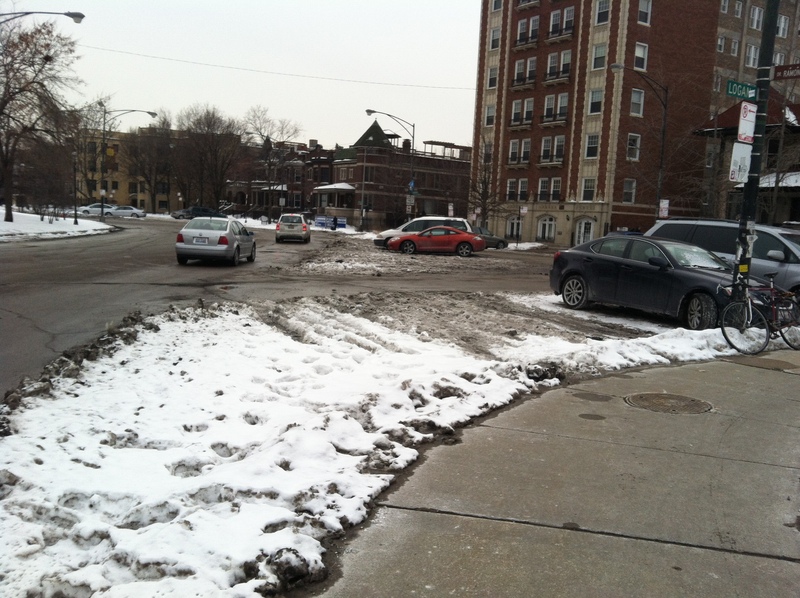 The term “sneckdown” has begun creeping into public conversations about traffic calming. It is a variation on the term neckdown, also known as a curb expansion, which shrinks a street’s width, thereby giving pedestrians a safer, shorter path across. 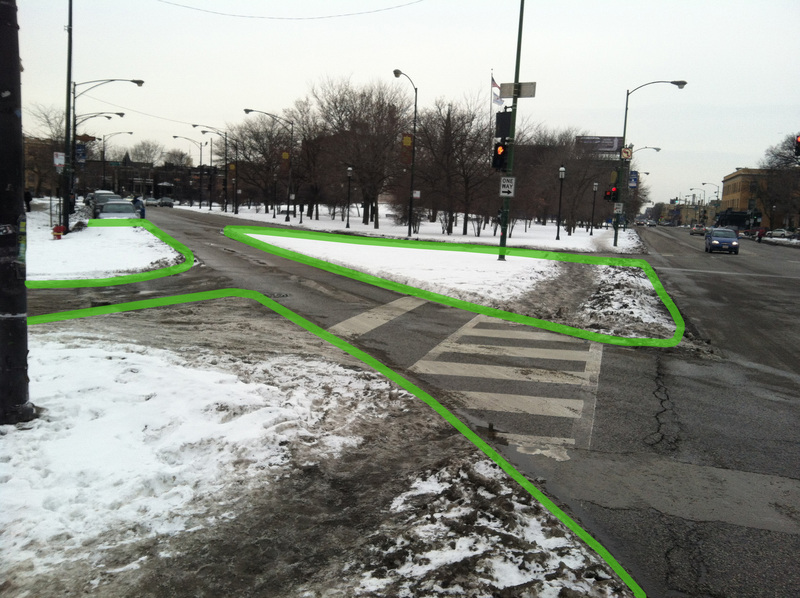 Logan Square has a prominently placed neckdown at Wrightwood Ave, just south of the Logan Square Blue Line station, which helps make Wrightwood one of the safest streets to cross around the Logan Square circle. Sneckdowns (snow + neckdown = sneckdown) occur naturally when snow builds up, creating inadvertent neckdowns all over our city streets. The phenomenon has been hailed as a valuable (and very inexpensive) way to assess what part of a street is being used and where it is unnecessarily wide. Bike Walk Logan Square took a few photos of sneckdowns in and around the Logan Square circle, which, despite being at the core of our neighborhood, is quite unfriendly to pedestrians. Take a look at the photos below, and imagine how much safer these streets would feel if their snowy encroachments were permanently curbed and filled with plants and decorative paving. Facing northwest, approaching the Logan Square Blue Line, two pedestrians cross the lane for vehicles turning off Kedzie Ave onto Milwaukee Ave. Facing south, traffic moves through the circle toward Wrightwood Ave. Facing northwest, where Milwaukee Ave meets the southeast portion of the circle. 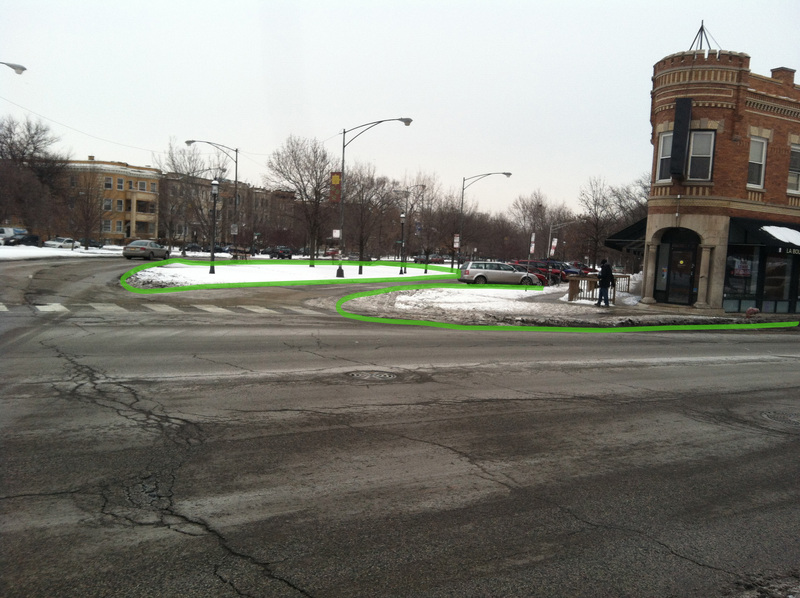 Facing northeast, where traffic crosses Milwaukee Ave and leaves the circle onto Logan Blvd. It’s interesting that you highlighted a chunk of sidewalk where there is no driveway/curb cut as somewhere that shouldn’t be sidewalk in the southwest corner sneckdown. I was there on Sunday wandering around, and thought it interesting that people just drove off the curb, rather than through the parking lot behind them where there was a real driveway. Yeah, that’s a pretty lame spot for an orchard. it’s a good place for a commercial building with residences above. 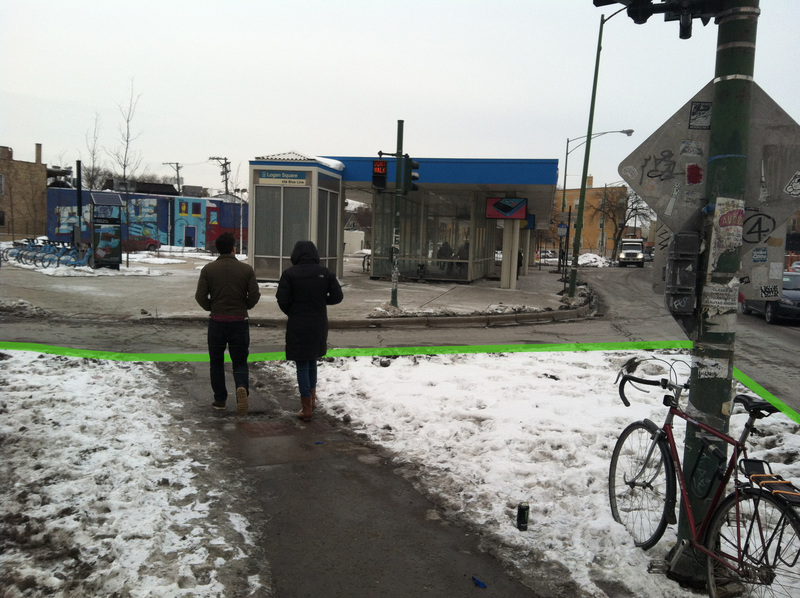 In the ‘Facing Northwest’ photo there is a right turn lane for cars to turn south onto Milwaukee. From what I understand, that lane is to be removed altogether. Yay! that may take five more years though. Thanks, Kevin. As I understand it, that type of turn lane, which makes a “pork chop” pedestrian island, will be removed from the city’s street design options.